Don't feel insecure about your writing or your life. Let the members of the #IWSG help. "What?" you may say. Read my post and leave a comment. 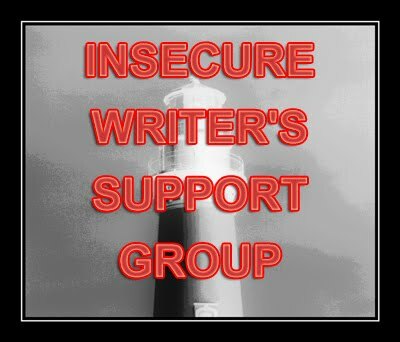 Then move on to read what others have offered on another Insecure Writer's Support Group day. For the list visit Alex J Cavanaugh's blog. In the 60's British rock group The Who sang "I hope I die before I get old" in their iconic hit "My Generation". The song's writer Pete Townshend and singer Roger Daltrey must be rethinking those lyrics now that they've gone way past thirty. This sentiment was common in the generation who used to declare "Never trust anyone over 30". Of course now those from that era who are still living are way past 30 and I would imagine most of them are treasuring their lives and hoping for at least a few more years. At times during my recent illness I would think about death and the things I still haven't accomplished in my life that I have hoped to do. Haven't you sometimes felt so bad that you thought Death was coming to take you away or at least felt so sick that death thoughts began crossing your mind? That's the state I was in for a while. Somehow feeling like total crap can cause you to just want to give up in a way, yet knowing what you have in life and hating to have to give up, you want at least another week, year, or decade. Morbid you may say, but this was the sort of thinking that was crossing my mind now and then as I lay in my sickbed. I've had a great life and I have no problem with that. I recall when I was forty I mentioned to a friend that if I died then I would have felt like I had led a very full life. That was twenty years ago and my life is even fuller and better now. I'm still not ready to go yet, but sometimes the insecurities about my time on this Earth come to the surface of my thoughts. I'm not ready to go yet. I have too much to do. I know I need to focus on my writing. I have so many ideas and stories to tell the world. Sickness can be a big setback. Many of you know this from your own experiences. In the throes of illness I was plotting my pathway to completing my goals. Later new goals come and more life roadblocks. Life keeps on coming and we never know what's around that next curve. Maybe some of you remember the Bible story of King Hezekiah who prayed for more time to live and then he recovered from a severe illness to live another fruitful fifteen years. For me fifteen years would be good. Fifty years would be better if they were years of reasonable health and self-sufficiency. I used to always tell people that I was going to live to 156 years old. I was much younger when I said that. Youth is often the domain of foolish thinking. Or maybe it's dreaming. Nothing wrong with dreaming I say. I've always been a dreamer. That's something I hope I never lose, but it's also something I hope I always use. Do you ever contemplate your own death? Have you known anyone who died before they could fulfill their dreams? If you could stay in good health, how long would you like to live? And yep, I hear you on those morbid thoughts while feeling super crappy. It's a great way of refocusing those goals though! I've had a few close calls and still wonder why I'm here. Although a fortune teller said I'd live to the age of 94. My brother died a few years ago at the age of 60 - way too young and with many dreams unfulfilled. Be well, spring is just around the corner! I admit I don't think about death. Even now. However, living to one hundred would be good. I'm in pretty good health now so as long as that didn't diminish, I'd be good. If I think about death of my guy or my friends, I spiral into a very dark place of despair. We're all 50 or almost 50 or just past 50 and yes, some of our friends are having close calls. My best friend had one in November with a slight heart attack. I'd love for all of us to make it well into our 70s and 80s. Esp. w/ my guy finally tracking me down after all these years...I want lots of time with him. There is so much traveling I still want to do. So many crafts to make. Back a few years ago when I was very depressed, the only things that kept me from killing myself were my dogs and the amount of crafts I still wanted to make. I do once in a while. But I know where I'm going when I go. So Hope is the key. Eternity is a mighty long time. I touch on death and the afterlife in Escalation, one person going one place and another going to the other. Of course, they traverse a wormhole to get there. Lee, I have had similar thoughts this year as I struggled with my health issues. But I reached the same place, I am not done yet. Not ready to go. When it's my time, it's my time and none of us have control over that. But I am going to live each moment as fully as I can until that time. Glad you are feeling better. Lynda -- Even if I make it half way to my age goal I'll be doing pretty good. Yolanda -- Sometimes winter can amplify the feelings of bad health. Spring is a time of new beginnings. Alex --I'm sure I'm in better health than I've been thinking lately, but being sick can make one think. JoJo-- Depression is probably the worst affliction. Glad you're past that. Stephen Tremp -- I'm of conflicted feelings about going on to the next life. I worry about leaving my family behind and missing out on life in this world, but the promise of the next life is exciting. Karen -- It's important to use time wisely. Yes, I wonder about death. But for some odd reason I never see myself at death's door. I've had several close calls with illnesses and a major accident over the summer, but yet, I'm still here. If I felt great, I'd love to live forever. Imagine being able to see the further a hundred years from, two hundred, five hundred. I guess at some point I'd tier out, but life is just too fascinating to me. Any kind of sickness can affect our writing. Whenever I have a simple cold I can't write until I stop sneezing! And when I had spine surgery, it took me many months (when I was physically better) until I was able to write again. I don't contemplate my own death, but I do worry sometimes that I won't be able to achieve everything I hope to before I die. And I would like to live well through to my nineties if I can. Hope your health is better now Lee. I also remember from that story that Hezekiah's desire brought about the destruction of Israel. At least, that particular destruction. People always tell that story from the perspective of "look at what his faith did," which is true, but the intent is "look at what his disobedience did." None of which has anything to do with what you're talking about, but it's one of my favorite stories. I have way more to do, too. I'll beat the odds if I live past fifty, some say. I'm 29 in less than two weeks and fifty sounds so young. But no one knows for certain. I could outlive everyone. If I do, it would be lonely but I'd be the best writer around! Michael -- Living for hundreds of years in decent health would be kind of cool, but you'd have to keep making new friends. Chrys -- Illness and physical discomfort can be a real distraction as far as doing other things like writing. Rachna -- I'm much better now--some weird lingering things that I'm going back to the doctor to have checked out. Otherwise I'm almost back to my old self. Andrew -- All the disobedience of God's people in the Bible is truly a source of wonder to me. Why didn't they get it when they saw God's power and mercy. Human nature I suppose--we forget easily. Jennifer -- We just never know do we? And maybe it's better that we don't. When my migraines were at their worst and I couldn't see the light at the end of the tunnel... death looked pretty good. I even fantasized about various ways I could go out that wouldn't technically be suicide. My favorite go-to back then was rescuing some child from an oncoming vehicle, but getting hit with enough force that death was instantaneous. Happy to say that those days are in my rear view mirror. I tend to think that we are all here for as long as we are meant to be... even if those reasons don't make sense to those left behind. We all fulfill our purpose and then move on. I must believe that God just doesn't make mistakes! I can relate to this post like crazy, Lee. Being ill is something I sure didn't think I'd be battling with at the age of 44 but, meh, such is life. It'll get better. When I was younger, I came very close to ending it, the pain was so severe. But, I couldn't. My parents would have been devastated. Plus there's that whole going to hell part I'd rather not do. But, I find that writing is a fantastic distraction that I am able to turn to. I hope things look brighter for you. Life's curve balls sure know how to get you to pay attention. I take it as it comes, dreaming as far as the wind blows...unless it's a hurricane or something. Then I run or try to duck and cover. Good stuff in this post, Lee. Robin -- I don't think there is ever a just cause for suicide. If we were intended to suffer then we should accept that. God gave us life and it is up to him to end it. Elsie -- I always worry most about those I'll leave behind. But life goes on for them as well. MJ -- No matter how much we may try to control our lives, there is always something that can come along and spoil our plans. Yvonne-- How in the world can you get banned from Facebook? I can't imagine what you could have posted that would be worse than some of the stuff I see regularly posted by others. A dose of illness does seem to deliver perspective. Hope you are all better now. Just want my husband to recover, makes everything else look unimportant. Yes, yes, and yes. 2011 and 2012 along with the first few months of 2013 were the worst of my life healthwise. There were times I truly thought it was over for me. Luckily I came out the other side and I'm very thankful. No one knows how much time they have left so get busy living, I say. Glad we are both still here! I got quite sick last year so I get that illness can be a setback. I'm just glad you're still with us Arlee. Death is waiting for all of us. But that's just it, death waits life doesn't. I don't think about it for me but I really wish my father was still around. Lost him twenty years ago and I still miss him and his wisdom every day. Me too--I still have so many things I want to do, places to visit, people to see. When I think of death and dying, I use it to motivate myself not to waste any time...and to eat healthy and exercise. Much of the time, it works. Hope too see you on the other side of 100, Lee. Liza -- Getting better than I was. Carole - When a loved one is suffering it's difficult to focus much on other things. Wendy - Yes, and I wish you well in the years to come. Patrick -- This old world may not make it until you hit 85, but if it does I hope you're there all the way with it. Sheena-Kay-- We shouldn't turn life into a waiting game when there is so much to do. Susan GK-- I lost my father in 1990. He was age 67. I hope to make it at least as far as he did, but I'd really prefer to make it much farther. Jagoda-- So much that life has to offer and I want as much as I can get. Having been sick myself in 2013 (in the hospital twice) I have definitely contemplated my own death. I know I will never do everything that I want to... who does? And the only regret is that I will never live long enough to read all the books I want to read. I guess I'm still too young to think about such issues, but this is a great post nonetheless. I've thought about death practically all my life, starting at six, when I lost my grandma. She died of cancer, and taught me all about the cycle of life and death. I'm not particularly worried about death, but I'm averse to pain. I'm fatalistic -- so I think I'll live as long as I'm destined to-- and in the meanwhile, I'll try to cram as much living as I can into each day, each moment. When you are in your mid to late 70s you think about death a lot more I can assure you. You don't have to be sick either. Living to 156 would be fine if you could guarantee mental health as well as physical health. Hi Lee - I hope you're on the way to a full recovery now. I certainly don't want to die yet ... and would like to live into my late 90s, being healthy til my late 80s at least and then having my wits about me til I slip away quietly I hope!! I have a son who is now 5 years clean from drug abuse. About two years into his drug habit we had to pluck him off an Interstate Bridge because he was threatening to jump because he was drug sick. I started that very night after coming home from the hospital planning his funeral because that is what I thought I was going to do, bury my child. Writing in it I went through every emotion of grieving as if he was already gone. Some have told me that was morbid. I thank God everyday for those answers prayers his rehabilitation and now celebrating his 5th year being clean and free of drugs. Sending well wishes and prayers your way. I am fascinated by/focused on dreams myself, and it crushes me to think of anyone living a good life and losing it prematurely. Right now death has taken solid shape in my life in the form of two different people with two different cancers. One is a cousin, only in her 30s, with so much left to live for and more joie de vivre than I've ever met in anyone else ... and I don't just say that because we're supposed to be supportive of the ailing. It really doesn't seem fair. The other is my husband's grandmother, who has seen her children grown, grandkids born and had their own kids, a 55-year marriage, a successful business, the good life. My question is this: how can HER unexpected cancer seem almost as unfair as that which struck my poor, young cousin? Is all death unfair? And, most of all ... why does the tragedy of another often cause us to spend so much time worrying about ourselves, and our own mortality? Even hearing about your sickness has given me feelings of anxiety, hope for you, and desperation to live my life well as long as I can. We have only this moment, after all. We're never guaranteed more. Yeah... I know what you mean. I think part of why I drive myself so hard is that I don't want to end up not having achieved what I wanted. I really became aware of this in my first year of university. A girl in my high school died that year. She was in tenth grade, with her whole life ahead of her. Bish -- The hospital experience can really put ailment into perspective. Fortunately I haven't had to deal with that too many times. Gina -- Stay young and healthy for as long as you can. Damyanti -- We need to live with as much quality as we can and accept fate as it comes. Jo - I would not want to live to any age in a state of dependency on others for everything. Health is essential for best quality of life. Hilary -- I think I'm getting better, but still I'm getting older. Gossip-- Losing one's child would be one of the worst losses of all I think. Positively -- Deep questions that many of us often wonder? Death can be pretty arbitrary it seems. Misha -- Life and time can go so fast and we need to find ways to use it wisely and still have a good time. Balance is what we need to achieve. Sadly, I do know a few people who died too young (high school). It still makes me very sad. IT does cross the mind. Health and wellness are things I deal with at times and so the thoughts do come. I tend to think about legacy a lot. What will I be remembered for. Here is hoping we both can see 156 and have minds intact. hello Lee, I didn't realise how I'll you actually were. Really hope you're on the way to full recovery. Illness takes us by surprise doesn't it. And almost forces us to re-think a lot of stuff, even to say to self 'don't sweat the small stuff'. Yes I think about death, it's hardwired into us. I've become more aware of the limited time we have left as I grow older and wonder, often, how to use this time fruitfully. Southpaw-- I know of several dear friends and school mates who have died--some many years ago--and it makes me ponder why some go early and others stay many more years. I'm thankful I've made it this far. Brandon -- I would like to leave a decent legacy. For my kids at least if not the world. Susan Scott-- Sickness can magnify the issues of our mortality. Usually it's not something that weighs so heavily upon me. This is the first post I am re-blogging and of course it could only originate from none other than our own Arlee Bird. I also relate with the topic discussed. Personally, I attempted suicide when I was 30 and this can tell how much I wanted to die and be burried ... Ah ha, now five years on, I am striving and kind of real happy living. I am thus trying to do so much for I don't know when I would go! My life is a beehive, my sleeping hours reduced, blogs and all sort of social media presences all started a few months ago when I moved country all together. I remember when my late husband was diagnosed as terminal. I overheard him talking to my baby brother and telling him that he wasn't afraid to die but he wasn't ready to leave me yet. Serious illness shows us our mortality. Just do what you love and enjoy whatever time you have on this earth. Remove as much stress as you can and have fun! Marie-- I think that many of us go through stages of loneliness, depression, or other states that leave us to consider that option of death. Dying should be the domain of the old who are tired and sick and never the young. Glad you made it past that stage. Donna - My biggest concern of what I would lose by dying is seeing my kids and their kids get older. My wife always reminds me that she wants to die first. I guess she doesn't want to have to deal with all the arrangements or whatever. Whichever one of us goes is something we probably have little say in if it is all by natural recourse. Never really contemplated my own death until I very nearly did (die) while giving birth to my oldest child. The older I get, the more I realize I don't want to live forever, but long enough to dance at my children's weddings and to fulfill whatever purpose I was sent here to achieve. I am going to live forever. mostly cuz i need to continue to embarrass my children long into their adulthood. As requested I am introducing myself. As for the question. My dad died of a massive heart attack in his sleep at age 70. He had retired six weeks before. I was only 21. It was a brutal blow to my mom who was 10 years younger than he was and had been married to him since age 19, during WWII. She was English and he was a Yank officer. It devastated me as he was my best friend and I was at a bad place in my life and he was encouraging me and helping me through some PTSD. He never got to enjoy his retirement and like his own father never knew many of his Grandchildren. He is still a force in the lives of his kids and their kids who hear about him from us and their grandmother. He had so much he wanted to do. Flat forward to me. I am currently disabled and unable to work. I contribute nothing to the needs of my family(my wife and I) still at home. I feel like I am a drain on the resources, energy and happiness of my wife. So at times I get so depressed that I think she would be better off without me. Fortunately I am married to the most wonderful beautiful smart amazing woman on the planet who tells me daily the sun would stop coming up if I left her. I am grateful to have so much to live for as I fight this fight. I don't want to give up and quit is not in my vocabulary. When I go is going to be up to God because I intend to fight for every last moment of joy I have with the woman I love. LuAnn -- As much life as we can grab and still be enjoying it is my philosophy. Pam -- Sounds like a worthy goal. Andrew -- I wish you well. Your outlook is good and that's a positive step.